Every time a superhero movie is released, every kid wants to look like a comic hero. While in the olden days the kids would resort to wearing their underpants over their trousers and turning a bath towel into a cape, these days they wear puffed up suits that make them look muscular and strong. Now think of compact crossovers to be the real superheroes, which have gained tremendous popularity; and now there are certain small cars that want to look like them. 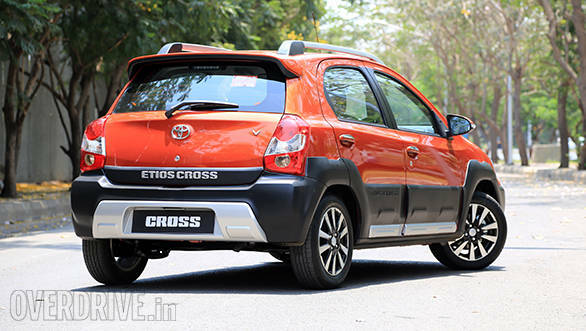 The newest example is the Etios Cross. 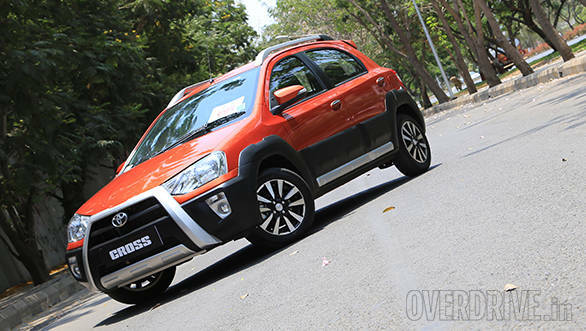 Unlike the yesteryear Palio Adventure which had the sheer length of a station wagon to match its rugged styling, the Etios Cross looks too small for the amount of armour it wears  its like Iron Man versus Captain America! The interiors of the Etios Cross are similar to the Liva - so you still get the centrally mounted speedometer & tachometer with a blue backlight, the quirky air-con vents and a double DIN audio system with Bluetooth telephony and steering mounted audio controls. The all black interiors with their gloss and matte surfaces look sportier than the interiors of the Liva. However the quality of plastics & the faux carbon fibre inserts look tacky. The top-spec V variants get chrome accents around the gear shifter and the air-con vents. 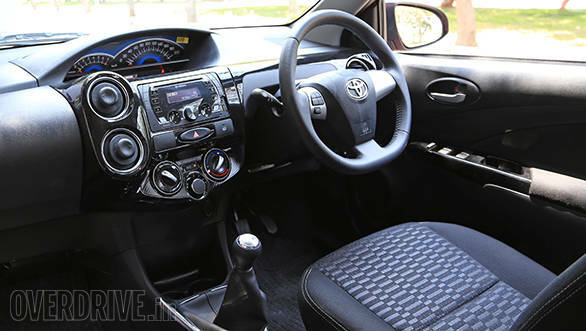 The black upholstery gets the 'Etios Cross' logo embroidered on the front seats, just below the adjustable headrests. Under the hood are three engine options to choose from - 1.2-litre and 1.5-litre petrol mills producing 80PS/104Nm and 90PS/132Nm respectively; and a 1.4-litre diesel that is good for 68PS and 170Nm. 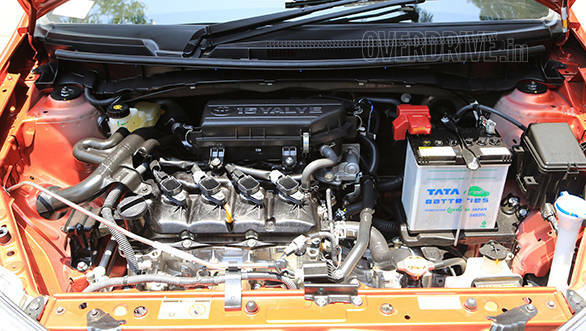 All the three engines are essentially the same options you get in the Liva and are mated to a 5-speed manual gearbox. We managed to sample the 1.5 petrol and the 1.4 diesel. We've always liked the petrol engine for its peppy and responsive nature and it continues to be so. The diesel seems more drivable in the city though with its better torque spread. On the highway, both engines feel powerful enough. The Etios Cross benefits from the improved sound insulation that featured on the mid-life makeover for the Etios line-up, however, the diesel variant does have audible engine noise in the cabin over 2500rpm. The claimed fuel economy figures for the 1.2 & 1.5 petrol and the 1.4 diesel are 17.71kmpl, 16.78kmpl & 23.59kmpl respectively. 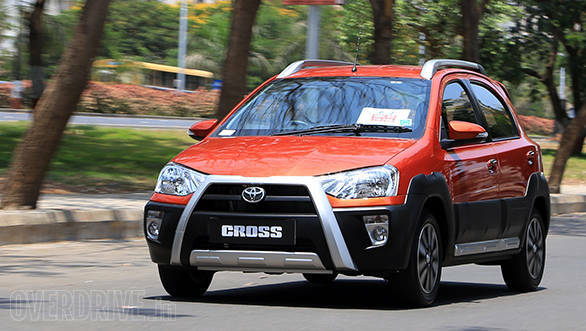 The Etios Cross is marginally heavier than the Liva - between 5 to 10kg depending on the variant. However, it is not significant enough to be evident when you are driving the car. Speaking of which, the Etios Liva was always a fun car to drive with a nice suspension setup - more so in diesel. Even in the Etios Cross, the diesel variant feels more stable and precise at speed and through bends than its petrol sibling. The steering system is vague at centre, but marginally better for the diesel variant. The brief sprint we had wasn't long enough to comment on the grip levels of the tyres but judging by the Etios Liva, the 185/65-R15 tyres are good for most chores. 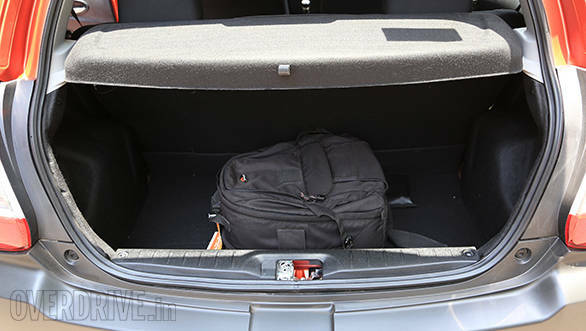 To sum it up, the Volkswagen Cross Polo has a cleaner design and better appointed interiors than the Etios Cross. 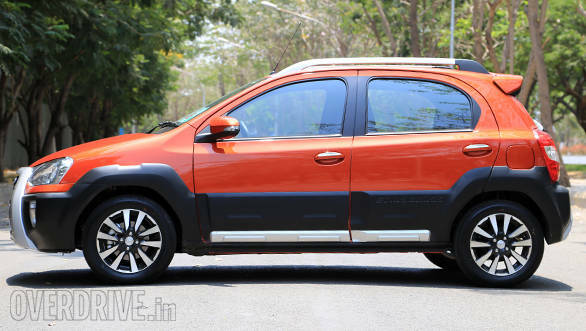 However, the Etios Cross, being based on the frugal Etios platform, will be cheaper to own than its European rivals and has better engine options too. So if you are not really looking for that commanding driving position that an SUV or a crossover offers, but need a car robust enough to compliment you on your cross country drives, while being frugal on urban commutes - then the Etios Cross could be a choice worth considering.